Enveloped, spherical. Diameter of about 150 nm. Negative-stranded RNA linear genome, about 15 kb in size. Encodes for eight proteins. The viral RNA dependent RNA polymerase binds the encapsidated genome at the leader region, then sequentially transcribes each genes by recognizing start and stop signals flanking viral genes. mRNAs are capped and polyadenylated by the L protein during synthesis. Most express a C protein by leaky scanning and V/W proteins by mRNA editing. 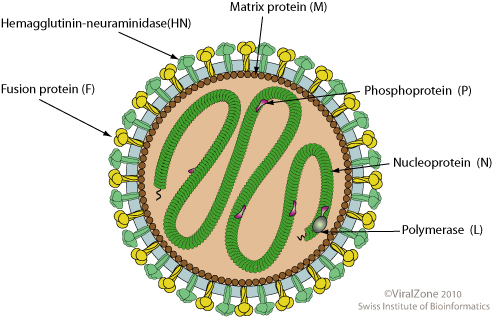 Virus attaches to host cell surface receptors through HN, H or G glycoproteins. Fusion with the plasma membrane; ribonucleocapsid is released in the cytoplasm. sequential transcription, viral mRNAs are capped and polyadenylated in the cytoplasm. Replication presumably starts when enough nucleoprotein is present to encapsidate neo-synthesized antigenomes and genomes. The ribonucleocapsid interacts with the matrix protein under the plasma membrane and buds via the ESCRT complex, releasing the virion.